Well, let me start by saying that I really miss all of you!!!! The last few months have gone by so fast, and now that Max is on the move, I’m finding that time for blogging is a thing of the past. I promise that I will try to catch up and post pictures when I can, and wanted to let everyone know that we have not forgotten about you. I am overwhelmed by how in love I am with my beautiful son. Max has a light in his eyes that can charm an entire room. He crawls in a quick, fluid motion….darting from one corner to another. He pulls up on furniture, my pants, the bed, anything he can get his hands on. He has a mischeivous grin, and loves enticing us to play hide and seek. He loves peek-a-boo, patty cake, and silly sounds. He says “Dada”, and he’s working on his “ma” sounds. He even says something that sounds a lot like “Go, Go, Go!”. 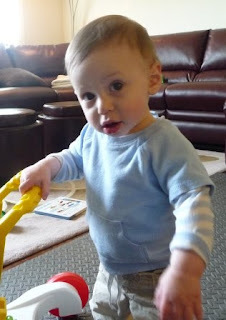 Max is becoming a little boy, and every day he seems farther away from being a baby. Today in music class he stood up and bounced (while barely holding on to my fingers). He laughed and smiled, and payed very close attention to the teacher. He crawled back to me, snuggled in to my lap, and turned around and gave me the biggest “eyes”. I love that my life is about spending these moments with him. I wouldn’t trade it for the world. I am overjoyed to be his Mommy. Love this picture! Max what a big boy you are! You look like a big kid! And Kim, you write so beautifully. You made me cry! Love you all! I am really jealous of the feelings you express here…I hope to one day know what you are talking about because it sounds so amazing.